One of the most wonderful ways to celebrate the season of Christmas is with the story of the Nutcracker. Hopefully, you can see a performance of this beautiful ballet by the 19th-century Russian composer Tchaikovsky this year. But, even if you can't see it live, you can listen to the music and watch some scenes from the ballet below. Clara's family is hosting a Christmas party. Her godfather brings a wonderful new toy for her--a nutcracker. But, her younger brother breaks it. That night as she sleeps she dreams a fanciful dream where her toy nutcracker comes to life and brings her to a magical land full of sweets and treats from around the world. That's it for the regular 15-minute music lesson. One of my favorite resources is the Maestro Classics music appreciation CD of the Nutcracker. I learned a lot about the background of the story. It's a fun way for kids to learn because they hear Tchaikovsky's music along with a narration of the story. It also includes a 24-page activity booklet. The Maestro Classics Nutcracker is available as a digital download or physical CD. Read more about the Maestro Classics Nutcracker CD here. SQUILT stands for Super Quiet UnInterrupted Listening Time and is one of the top Music Appreciation companies for homeschoolers. 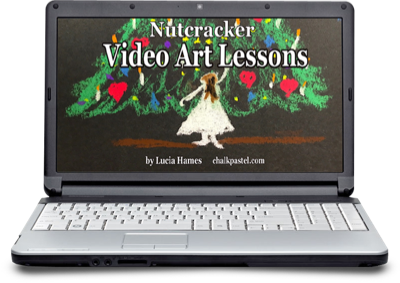 In their Nutcracker Holiday Unit Study your kids will learn about ballet, the instrument called the celesta, and about Tchaikovsky. There are several notebooking pages included. 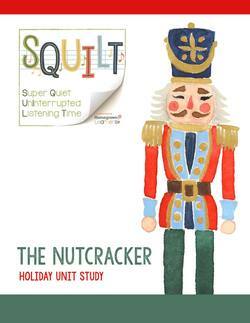 You can read more about the SQUILT Nutcracker Holiday Unit Study here.